The Montgomery County Council’s Public Safety Committee at 9:30 a.m. on Thursday, Sept. 13, will receive an update from Montgomery County Police on the County’s speed camera and red light camera programs. The red light enforcement program has been in effect in Montgomery since 1997 and the Safe Speed camera program, designed to reduce speeding, has been in place since 2007. The Public Safety Committee, which is chaired by Phil Andrews and includes Councilmembers Roger Berliner and Marc Elrich, will meet in the Third Floor Conference Room of the Council Office Building at 100 Maryland Ave. in Rockville. The meeting will be televised live by County Cable Montgomery (CCM—Cable Channel 6 on Comcast and RCN, Channel 30 on Verizon). The broadcast also will be streamed through the County Web site at www.montgomerycountymd.gov. The County currently has 56 active fixed pole speed-monitoring cameras, 20 portable cameras and six mobile vans equipped with cameras. Speed camera tickets are $40 and red light camera tickets are $75. These are civil citations and no points are assessed on a driver’s license. National data reviewed in 2005 showed significant reductions in crashes, including fatal crashes, close to speed camera locations. Fourteen studies were reviewed that showed collision reductions of 5 to 69 percent near speed cameras. There were reductions of 12 to 65 percent for collisions that involved at least one injury. There was a 17 to 71 percent reduction in fatal collisions. According to the Insurance Institute of Highway Safety (IIHS), the studies that contained data for longer durations showed that the trends were either maintained or improved with time. In 2011, the IIHS compared large cities with red light cameras to those without cameras, and found that those with cameras had a reduced their fatal red light running crash rate by 24 percent. However, there has been some concern regarding safety of red light camera use in the belief that the cameras motivate some drivers to make sudden stops at intersections, causing collisions with tailgating vehicles. IIHS data indicate there are some studies that report red light cameras do in fact increase rear-end crashes. These crashes tend to be much less severe than the T-bone crashes that can occur when drivers run red lights. The number of these T-bone crashes has been reduced with the use of red light cameras, which IIHS calls a positive net effect of this type of automated traffic enforcement system. Another federal study by the Federal Highway Administration looked at data from seven cities and found that right-angle crashes decreased by 25 percent while rear-end collisions increased by 15 percent. The positive aggregate economic benefit was $18.5 million across the seven jurisdictions. There are other studies that show no significant change in rear-end injury crashes from the use of red light cameras. At 9:30 a.m. in the Seventh Floor Hearing Room, the Health and Human Services (HHS) Committee, which is chaired by George Leventhal and includes Councilmembers Nancy Navarro and Craig Rice, will hold a worksession on the Montgomery Cares program. Montgomery Cares is one of the nation’s foremost local programs in providing health care services to low-income residents and those without health insurance. In Fiscal Year 2012, Montgomery Cares served 27,814 unduplicated patients. This includes patients served through the Healthcare for the Homeless Program. Data shows an increase of 937 patients from FY11. These patients had 77,162 encounters at the primary care clinics—an increase of 3,800 from FY11. 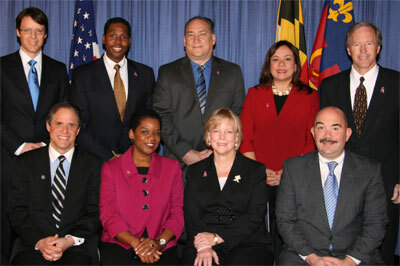 The Council approved FY13 funds to expand both the number of patients who can be served and the number of encounters. The HHS Committee also will receive an update on efforts to remediate chronic air quality and mild issues at the Davis Library in Bethesda.